In 1973, less than a year after achieving his dream of graduating from The University of Texas, Carl lost his life in a freak car accident. Carl Johnson accomplishments remind all Longhorns that In sports and far beyond, his contributions to Longhorn heritage have shaped the present and empowered the future. I met Carl Johnson in 1968 in Austin. As the only African-American athlete on our University of Texas track team, Carl had skin a different color than mine. He lived alone in the athletics dorm. But we had other things in common: we were both freshmen, scared and homesick, and we both persevered to achieve success during our four years — we were four-year lettermen and All American selections, elected co-captains, and graduated with two conference championships. But from our four years together, the memory that will forever be in my soul is from 1971. We had traveled to Lawrence to participate in the Kansas Relays, and on the day of competition, we had stopped at a local diner. We ordered a full meal from the menu; I probably ordered a cheeseburger and fries. As we were leaving for the track for that day’s competition, I noticed that Carl had not eaten lunch, and I was worried that this might affect his performance. I had no extra money myself, but the University always gave us money for meals, and I was perplexed as to why Carl had not eaten. We were all aware of Carl’s situation, but we couldn’t really relate, as we never had to deal with the life challenges that he faced. For shirts, Carl cut the corners out of the mesh laundry bags we were issued for our uniforms and wear them over his T-shirts. That’s how poor he was. Of course, in that day especially, poverty and racism went hand-in-glove. On one trip to Houston we stopped in La Grange to have lunch. Upon entering the restaurant, the owner approached our head coach, who at the time was Jack Patterson. (Patterson left to become the athletics director at Baylor and was replaced by Cleburne Price.) The proprietor told Coach that the white athletes could eat in the restaurant but the [n.....] would have to eat with the cooks in the kitchen. I’ll never forget how upset Coach Patterson became when he responded to the owner of the restaurant that we would eat together as a team or would leave. As we all listened to this exchange, the owner relented and let Carl eat in the restaurant with the rest of us. This was a real bonding experience and gave us a brief insight as to what Carl had to deal with on a daily basis. You can also see why Jack Patterson was a great coach: he believed in treating everyone with dignity and respect. We didn’t care about skin color — we were athletes on a mission to win. And while I don’t remember any racial conflicts on the team, I don’t think many of us were very close to Carl. He was a very private person who kept to himself or associated with the few African Americans on campus. I don’t believe we could really understand how lonely Carl was during his four years at UT. That night in Lawrence, four members of the UT track team unexpectedly made the finals of the sprint medley relay. Carl opened with a blistering 220 and handed the baton off to me to run the second 220. After running one of the fastest splits of my career, I handed off to Ed Wright, who ran a spectacular 440 leg. Ed made the final transition to Dave Morton as he anchored the relay with a world class 880. The result: the fastest time in the world — 3:16.7. We were a team, and, even though we didn’t always get along, we cared for each other and expected excellence. Even though his early death was tragic, his life was triumphant, and, in an odd way, complete. He had achieved at least two major life goals, and how many of us can say that? Carl had 1. been elected team captain by his peers and 2. graduated from college. It’s doubly triumphant since he achieved his goals against such odds. It’s not the number of years you live, but what you accomplish in those years. And the engine that kept him running was hope. It’s been said that a person can live 40 days without food, four days without water, but only four seconds without hope. I truly believe that what gave Carl hope for a brighter future was his scholarship. Too many people quit before the blessing. Carl didn’t quit, and his story of perseverance will live in my heart forever. A couple of months ago, a man named Bobby Lacy walked into the Standard-Times and asked if I could help him find some information from our office library on his old friend, Carl Ray Johnson. 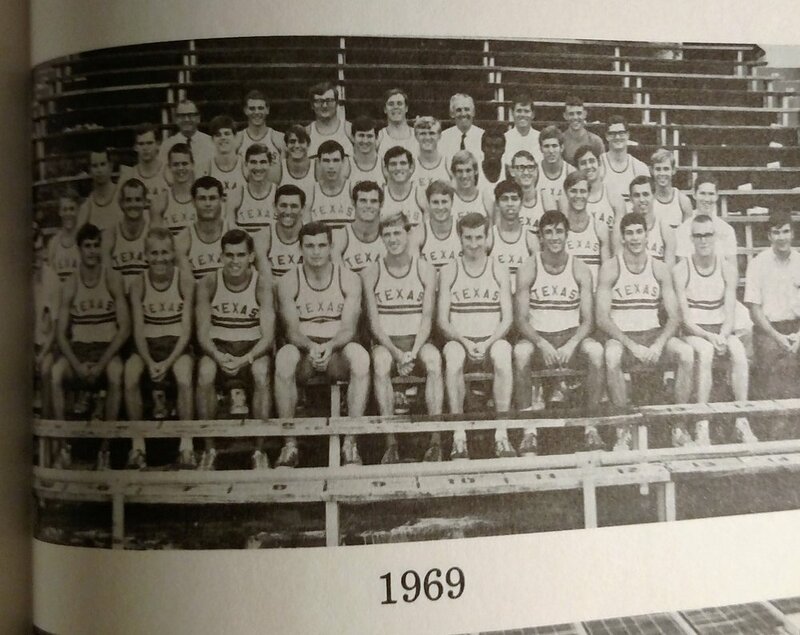 He was wanting to know — for the purposes of a friendly bet — how Johnson had finished at the state track meet in 1968. I recognized Johnson’s name because San Angelo has a recreation center named after him, but that’s all I knew about the man. I was intrigued to find out a little more about this former Central High School athlete, who was talented enough to qualify for the state meet and have a gym named in his honor. Once I began researching him, I uncovered more than I ever expected. As a sophomore, Johnson took second place at the state meet in the 220-yard dash. After being slowed by injuries as a junior, he was third at state in the 440 as a senior (answering Lacy’s question). Johnson even twice qualified for the U.S. Jaycees National Track Championships. Yet his greatest achievements were still to come. He was an All-American runner at the University of Texas, where he became the first black athlete to earn a track scholarship at the school. He was elected as a captain of the Longhorns track team his senior season in 1972.
Who knows what else he might have accomplished if not for a car accident north of Austin that took his life on July 2, 1973. He was 23 years old. Today is the 40th anniversary of Johnson’s death. His legacy still lives on at the Carl Ray Johnson Recreation Center in the 1100 block of Farr St. The gym was named in his honor on June 1, 1982. It was fitting for the center to bestow his name, not just because of Johnson’s athletic talents, but because of his passion for helping better his community. Johnson majored in sociology at UT and worked with youth in impoverished neighborhoods in Austin. Last year, Johnson’s life was celebrated at a Texas Exes luncheon in San Angelo, and Central High School created a scholarship, the Carl Johnson Spirit Award, in his memory. Forty years later, Johnson is still impacting lives. Lacy also spoke at the luncheon, reciting a poem he had written about Johnson. Lacy said that while Johnson was best known for his accomplishments in track, he was also an outstanding basketball player. The 6-foot-2, 180-pound Johnson led the Central Bobcats’ basketball team to a 22-7 record his senior season with 579 points. His grade-school heroics are the stuff of legend in San Angelo. Johnson won eight events and took second in another one year at the Little Olympics. I found numerous clippings about Johnson in our library, and I read all of them. I consider it a privilege now to know so much about one of the great athletes and people to ever call San Angelo home. Of all the things I read about him, I most admired his spirit for wanting to make the world a better place — and working hard to make it happen. If you were like me and the Carl Ray Johnson Recreation Center was just a name to you, hopefully the next time you hear about it or drive past it, you’ll think about the man.